About a month ago I posted about my coin collection and how I love the stories and history associated with the random coins I've collected since I was a kid. It was around that time that I came across a bunch of old Soviet and Russian coins on eBay and bought them. Over a month later this package from a small town in Russia arrived. Inside a light blue envelope there was a cardboard plank sealed with packing tape. 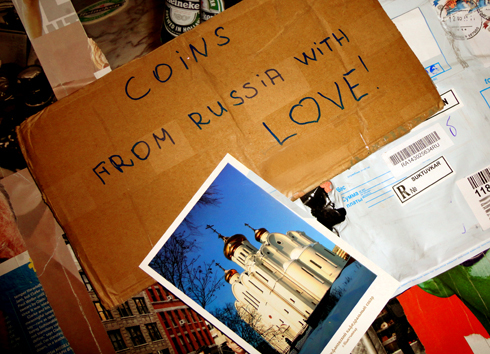 It read 'Coins from Russia with Love!'. Included with this was a postcard from the town in central Russia, which pictured a giant old church and a small note about the coins. It was kind of like receiving mail from an old friend or family member. I've never ordered anything on eBay that was sent in such a personable way. 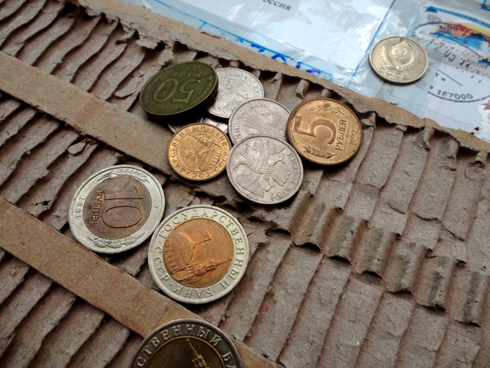 Beneath the first cover of cardboard, there was another layer where the coins were hidden in carved out rows. 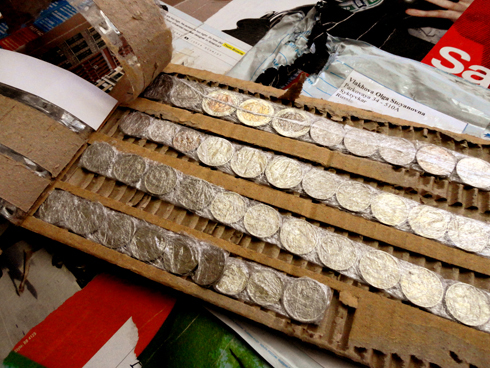 When I opened them, the coins were clearly laid out, but wrapped again in a clear layer of saran wrap. 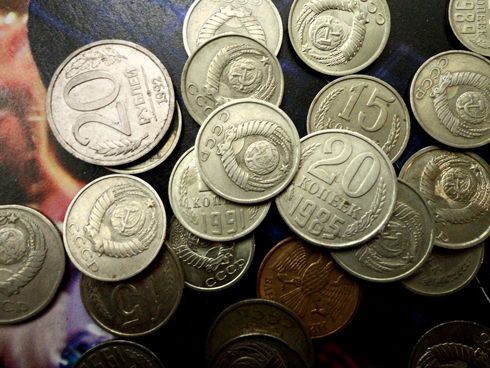 The coins I purchased were a random mix of Soviet kopecks from the late sixties up until the late eighties, as well as random modern Russian coins from '91 onward. My favorite pieces were these 3 '10 Ruble' coins from 1991. 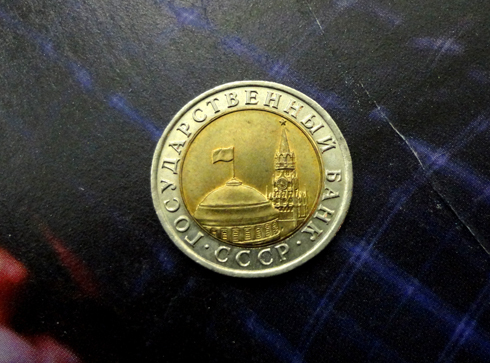 This was the year the Soviet Union collapsed, and these coins feature an image of the Kremlin. These two tone metal coins are also similar to Canadian toonies, or $2 coins here. I've always been fascinated by Cold War history and so I love how something like this made the connection tangible. 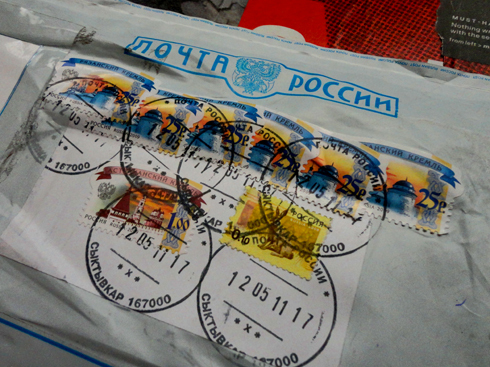 The package from Russia wasn't just an everyday order either, and I found myself savoring the experience of opening it (hell, I photographed it as I went along!). 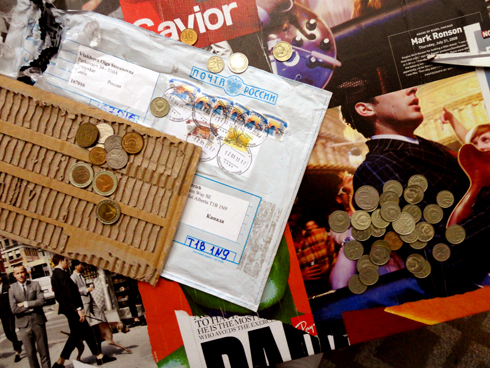 Through some clever wrapping, a postcard, and some personal messages, the impact was more than just the history of some coins. With just that small amount of personality attached, I got my own unique story to share along with them. Ahhh... it's so great to hold something in your hands that has such history. My younger sister was always more into collecting old coins, while I collect old WWII memorability. Although admittedly most of what I have belonged to either my great grandfather or great uncle. Enjoy your coins, they're beautiful! What a cool find! 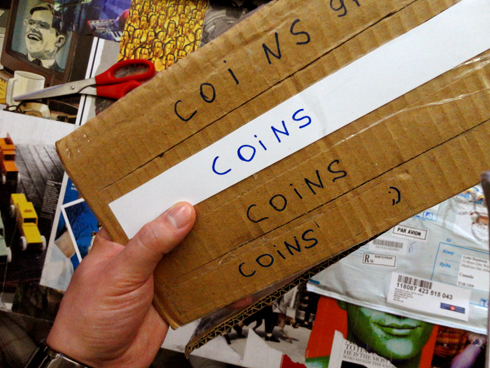 The personal touch from the seller but also the secret stories those coins could tell. Thanks for sharing.